Golden Lane Community Centre, Fann Street, EC1Y 0RN. Saturdays 10:15 & 11:15am. For stress relief, improved coordination and balance; cultivate internal energy, general muscle strength, enhance well-being and fun too. Suitable for all ages, beginners welcome. Equivalent to £8 per class, termly fee apply. Full details, e-mail 6harmoniesTaiChi@gmail.com or text 07950 392028. Henry Herbert Tailors: bespoke suit and shirt makers, offering a visiting service to residents of the Barbican. You are very welcome to visit us in Bloomsbury at our workshop or we are very happy to come to you. Everything we make is made in England. See henryherbert.com or email henry@henryherbert.com for more details. If you are a moderate player (neither beginner nor ‘wizard’) and would enjoy the occasional game of chess, please contact: Berthewallis@gmail.com or telephone 0207 588 1665. We could meet in each other’s homes for congenial afternoons or evenings. Do you enjoy playing bridge? If so, do come along to the Barbican Bridge Club’s duplicate evenings, which are held on the first Monday of the month (or second Monday if the first is a Bank Holiday) from 7pm to 10pm. We meet in the Lilac Room, 02 level of Seddon House. New participants are always welcome. We charge £1 a head to cover cost of cards etc. and this has to be the best value one can get in the Barbican! For further information please ring Karolin Arnott on 020 7588 2668. Very personable lady with extensive caring experience will clean your flat, do your ironing and offer physical help for those residents who might need caring assistance through ill health or physical impairment. Contact Rosemarie by email on rosemarie.teves@gmail.com or by phone on 07907 217 894 for further details. 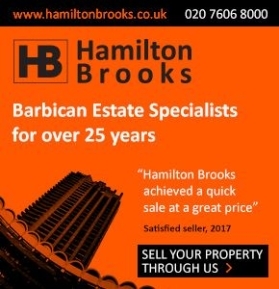 Lady is Barbicanophile with existing Barbican client who would be happy to offer a reference. For a reliable and conscientious domestic cleaner who already cleans a number of Barbican apartments, call Claribel on 07949 768679. Light domestic cleaning and ironing undertaken. Also specialist cleaning of apartments pre- or post-occupancy. References from existing Barbican clients available. Portuguese lady who has lived in UK for more than 20 years and runs own cleaning company will efficiently, undertake your cleaning and ironing. Available for cleaning apartments, offices, end of tenancy cleans, carpet cleaning, oven cleaning etc. Can make old Barbican baths sparkle! Highly recommended. Barbican and other references available. Call Maria Pinto on 020 7686 0085 or Mobile 0790 067 2005. Maths Tuition offered at all levels to include GCSE, IGCSE, AS and A2 in both Maths and Further Maths for Edexcel and MEI examining boards, by a recently retired maths teacher with over forty years teaching experience and an excellent track record of exam success. Modules include Pure Maths, Statistics and Mechanics. Please contact Jenny on 07737395874 for more details. Maths Tuition, by an Imperial College Graduate. 11+, 13+, GCSE and A-level Pure models 1,2, 3 and 4. Call Daryl-Rhys: 07906411358 or email: drt_@hotmail.co.uk. North Norfolk Coast. Beautifully renovated coach house with flint walled garden owned by Barbican residents. Located a few minutes from the beach in the picturesque village of Cley; perfect for both short breaks and holidays. Visit www.manorcoachhousecley.co.uk or call us on 07957 331388. Belaire (Estepona), Spain: Superb brand new 2-bedroom (both en suite) spacious all-marble penthouse apartment in small complex with roof terrace. Sea views- Newly furnished. Beautiful grounds with swimming pool complex. (Belaire is about halfway between Malaga and Gibraltar. – 45 min taxi ride from Malaga airport). Public transport available from airport to apartment if required. Secure car parking in complex. Apartment is in elevated position around 8-10 mins walk from great beach. Supermarket, banks, bus stop, golf courses and 5* hotel resort close by. For further details and pics contact Jill Smith – Phone: +44 (0)7932 140800. Email: jillsmith@go-plus.net. La France Profonde – beautifully restored former mill house and barn for summer rents in the Lot valley. Private pool, large garden, sleeps 6 or 10. See www.moulindelatour.co.uk or contact Hilarysunman@gmail.com, or call me on 07785 300862 for prices and availability. Near Morzine/Portes du Soleil: luxury self-catering ski chalet with concierge service. Sleeps 12/14 in great comfort. Sauna, hot tub, log fire, books, games, antiques, fantastic views. See chaletgueret.com or email info@chaletgueret.com for more details. French Riviera (Antibes/Juan-les-Pins), stylish modern two bedroomed apartment set in an exclusive small private development. Very tranquil setting, yet just a short walk from the beach, shops and all local amenities. Attractive gardens and swimming pool. Ideal base for exploring the Riviera (Nice, Cannes, hill villages, art galleries) or simply lazing by the beach. Less than 30 minutes from Nice airport. Owned by Barbican resident. Please contact Andrew.kerr@btinternet.com for more information and pictures. For better day-to-day health and vitality and help with your individual health concerns, including weight management, bloating and digestive problems, fatigue and raised cholesterol levels. Barbican resident Zeller offers practical support. Nutritionist Zeller has a BSc, is CNHC registered and mBANT, and has been in practice here for 7 years. Appointments available at the Body Repair Therapy Room at Golden Lane Sport & Fitness and also at Cissors Palace salon in Lauderdale Tower. See my website www.zp-nutrition.co.uk or contact me on zeller.pimlott@btconnect.com or 020 7920 9647. Line Rental, Internet, Mobile phones, Electricity. BEST VALUE recommended in Which Magazine. SAVINGS ;- more great value services you take the more you save. SIMPLICITY;- Helping you keep track of your utility spend with one monthly bill. SERVICE;- Award winning customer service. Well established, on the London Stock Exchange.